Originally Posted on pghcitypaper.com and written by Celine Roberts. First World problem though it might be, struggling through a wine list can be anxiety-provoking. The desire to try new things is often tempered by the fear of spending $15 on a glass of wine you might not love. 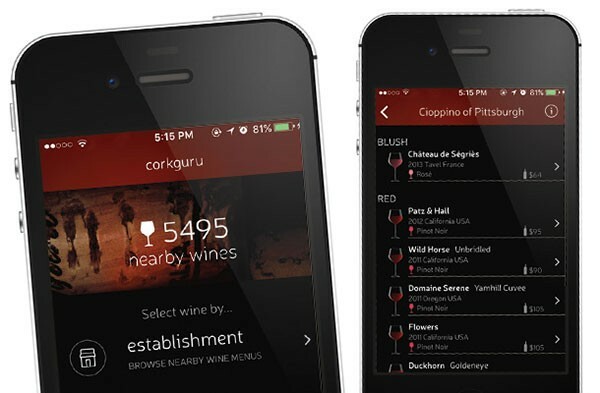 CorkGuru, a new Pittsburgh-based wine-selection app, is here to help. CEO Danielle Gillespie is a software engineer and a wine-lover whose mission is to get people excited about something new. Her app began as an iPad program for restaurateurs and restaurant managers to help them keep their inventory up to date and organized by varietal, vineyard and price. Now the company is launching an app to help consumers develop their palates. CorkGuru lets you select wine by establishment, or by color and taste with a tool dubbed SpectraVin. Any establishment that uses the iPad program can make its wine list public and allow you to see an updated version, complete with winemakers’ notes and other details. The app creators consult with the restaurants to build a database of knowledge about the wines as well as going directly to the vineyards. CorkGuru’s board of advisers includes experts like sommelier Christian Tripodi, of Cioppino. SpectraVin takes a more laissez-faire approach, allowing you to choose from among 10 categories, like Fruity & Crisp and Warm & Toasty, to help you track down something in your wheelhouse. If you’re still stumped, you can implement the fun Spin The Bottle feature, which asks you to pick between three sets of descriptors before recommending some vino. Let’s be honest: Wasted booze is a bad thing, and if you pick a bad bottle, you’re still going to drink it. This is a lighthearted way to abdicate responsibility for making a choice. If you strike liquid gold, add the bottle to your wine history, allowing the app to learn your preferences. And Android users, never fear: CorkGuru intends to roll out a version for you very soon. Click to read the article on pghcitypaper.com.